Clearly this is the season of sugar, spice, everything nice and a house filled with friends and family. We wish you love and laughter every time you're cooking. This is equally dangerous as an hor’s d’oeuvres or for a holiday breakfast. It’s best to over-estimate how much you’ll need as they disappear quickly. They can be made in advance, refrigerated, and reheated. Serves 4, if you’re lucky. 1. Preheat oven to 350°F. Stir together brown sugar, cayenne, and pepper (if being used) in a small bowl. 2. Arrange bacon slices in 1 layer on a large broiler pan and bake in middle of oven for 20 minutes. Turn slices over and sprinkle evenly with spiced sugar. Continue baking until bacon is crisp and brown, 15-20 minutes more. Transfer to a rack over paper towels to drain. Serve immediately or reheat. 1. Fry the bacon pieces in a medium-sized skillet until crisp. Drain on paper towels and reserve the fat from the skillet. 2. Sauté the bread slowly in the hot bacon fat until crisp and browned. 3. Whisk the garlic, vinegar, lemon juice and mustard together in a mixing bowl. Whisk in the herbs. Very gradually drizzle in the oil, whisking continually. Season. 4. Combine the salad greens, bacon, and croutons in a salad bowl. Slowly add the dressing until greens are tossed and just coated. Reserve the remaining dressing. 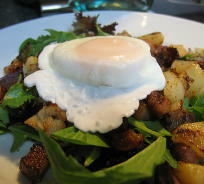 Sprinkle each portion with Roquefort cheese and top each with a poached egg. A terrific side to our Roast Pig, this recipe, taught to us by a Brazilian friend is beloved and is often the basis for many variations in our kitchen. We sometimes add chunks of sautéed hot and sweet Italian sausage links, steak, or venison and it becomes an entrée which we serve over rice. Serves 8-10. 1. Heat the oil in a soup pot over medium-low heat. Add the onions and garlic and cook over low heat until the vegetables are tender, about 10 minutes. 2. Drain the beans and add them, the pork, and the 6 quarts of water to the pot. Stir in the 2 tablespoons of cumin, the oregano, bay leaves, salt, pepper, cayenne and 2 tablespoons or the parsley. 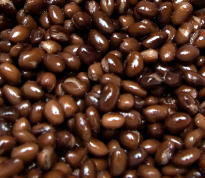 Bring to a boil, reduce the heat, and cook, uncovered until the beans are very tender and the liquid is reduced by about three quarters (about 1½-2 hours). 3. If you’ve used a ham bone or hock, transfer it to a plate, cool slightly and pull off any remaining meat, shred finely and return it to the pot. 4. Stir in the remaining parsley, bell pepper, cumin, the sherry, brown sugar and lemon juice. Simmer for another 30 minutes, stirring frequently. Taste, correct the seasoning and serve very hot, garnished with a dollop of the sour cream. • Kumquats or apples for garnish. 1. 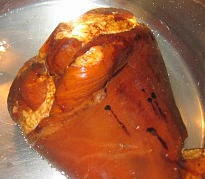 Rub the lime halves all over the body of the pig, squeezing the juice liberally; rub the cavity as well. 2. With the tip of a sharp knife, cut slits ¾ inch deep all over the body of the pig (not the head). Cut 5 of the garlic cloves into slivers and stuff the pieces into the slits. 3. Finely mince the remaining 13 garlic cloves and place them in a medium-size bowl, with the oregano, capers, brine, olive oil, salt, pepper and curry powder. Stuff half this mixture into the cavity of the pig and rub the remainder all over the outside. Place the cilantro inside the cavity. Let the pig rest, covered, in the refrigerator for 24 hours. 4. Preheat the oven to 400°F. Place the pig on a rack in a large roasting pan and bake 30 minutes. Reduce the heat to 350°F and roast until the juices run clear when the meat is pricked with a knife, approximately 3½ hours. 5. Place the apple in the pig’s mouth, and serve on a large platter, garnished with the greens and fruit. Enjoy immensely. This elegant cut of lamb cooks quickly, and multiplies easily making it ideal for crowds. Keep the cooked racks warm in a 200°F oven or covered on the top of the stove. Each rack serves 4. 1. Preheat the oven to 450°F. Place both racks of lamb in a roasting pan, fat side up. Rub the tops lightly with olive oil and season with the salt and pepper. Roast the lamb in the upper third of the oven until browned 10-12 minutes. 2. Meanwhile, combine the parsley, garlic, breadcrumbs and lemon zest. Turn the rack, meat side up and pat the parsley mixture evenly over the meat. Drizzle with the butter, then return to the oven and roast for another 12 minutes for medium rare meat. 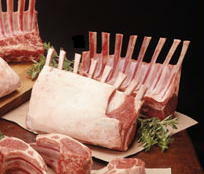 Carve the racks and serve immediately. 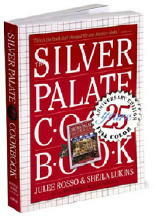 Even though everyone has their own special chili recipe, this Silver Palate classic has clearly stood the test of time. We love to hear that it’s become a family’s favorite and we think that it’s an especially smart cook who has a batch of this on hand during the holidays to serve spontaneously. We like to serve it surrounded by bowls of sour cream, chopped white onions, minced Jalapenos, and grated British Cheddar to serve as garnishes. Of course, you can reduce this. Serves 32. 1. Heat the olive oil in a very large heavy pot. Add the onions and cook over low heat, covered, until tender, about 10 minutes. 2. Crumble the sausage meat and ground chuck into the pot and cook over medium-high heat, stirring often, until the meats are well browned. Spoon out as much excess fat as possible. 3. Turn the heat to medium-low and stir in the black pepper, tomato paste, garlic, cumin, chili powder, mustard, salt, basil, and oregano. 4. Add the drained tomatoes, Burgundy, lemon juice, dill, parsley, and kidney beans. Stir well and simmer, uncovered, for another 20 minutes. 5. Taste and correct the seasoning. Add the olives, simmer for another 5 minutes to heat through, and serve immediately. This is one of those sweet recipes that when resurrected, makes everyone happy. We never have the heart to tell anyone how easy it is. The trick is to start with great crisp chocolate wafers, chocolate chip cookies, or almost any crisp cookie such as gingersnaps, either those you buy or your favorite recipe. Flavorings for the whipped cream and mascarpone are unlimited...try coffee or mint, raspberry, banana, almond, hazelnut or a myriad of liquors. We’ve loved them all. From there, it’s a cinch. Serves 8. 1. 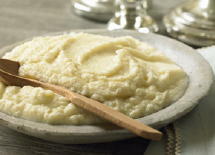 In a medium sized bowl, using an electric mixer on low combine the heavy cream, mascarpone, sugar, Kahlua and vanilla. Combine well and then slowly increase the speed until it forms firm peaks. 2. 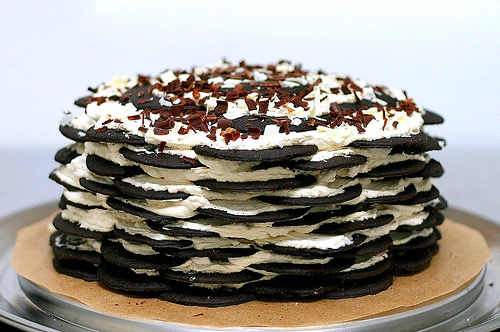 Arrange 8-20 (depending on size) cookies in a single layer on a 12-14 inch plate, in a 7-8 inch circle covering the bottom as much as possible breaking cookies to fill in any gaps. Spread 20% of the whipped cream evenly over the cookies. Repeat the layering of cookies and cream until there are five layers, ending with a layer of cream. Smooth the top and cover with plastic wrap, refrigerating overnight. 3. When ready to serve sprinkle the top with the chocolate shavings and cut into thin wedges, as it’s very rich. Serve cold. My friend Susie makes a wonderful ice cream pie with a chocolate wafer crust and four layers of her family's favorite ice creams. It's another simple dessert to have on hand during the holidays. An 8” pie should serve 8-12 people. For the crust, she uses 2 cups of crushed chocolate wafers (or Oreo Thin Crisps) mixed with 1 stick melted butter and two tablespoons sugar pressed evenly into a pie plate. She then takes 4 different ice creams (we used Chocolate, Coffee, Dulche de Leche and Rocky Road, 1 pint of each, soften one at a time for 10 minutes (just so it’s manageable), and spread it evenly over the crust. With each layer she re-freezes it for about 30 minutes. Repeat this softening, layering and refreezing process with each ice cream, three more times. She tops it all off with crushed Heath bars sprinkled on top. Freeze the entire pie for 4-6 hours until very firm. Cut into thin portions using a sharp knife, dipped into hot water. This is very rich, but heavenly. • The party’s fun begins with the invitation. • Carefully plan who to invite before you plan what to serve. • The host’s mood sets the tone of the party. Have one drink before the first guest arrives. • Greet each guest at the door. Make them their first drink and show them the bar for the next. • Don’t make the party formal - it’s such a snooze. • Squeeze your guests into a room or at the table. There will be much more fun. Promise. • Set tables in unexpected places … in the kitchen, near a fireplace, in the library or in the barn. • Show your wit with music loud enough to talk over, and lighting soft enough to compliment all. • Keep the rooms cool. • Keep the food light and simple. • Never, never run out of ice. • Don’t over-extend the cocktail hour before dinner. Booze needs food. • Always have chilled champagne on hand. • Always do favors. Everyone loves a surprise. • Light up the outside to extend the party. • Don’t try and impress. It’s all about fun! • Candles insure flirting which insures sizzle. • Salty and crunchy always works with drinks. • Listen to your guests. • A guest should arrive ready to entertain too. • Keep the food light and serve an amazing dessert. It is what will be remembered. • Never run out of anything mid-party. • Don’t do a buffet unless its just a cocktail party with heavy hor’s d’ouevres. If it’s dinner, everyone will end up eating at a different time. Set up tables of 4 or 6 and pass food family style. • Don’t use assigned seating - allow guests to mingle and let the evening evolve organically. • Mix and match everything … people, dress, plates, chairs and ethnic foods. It all works. • Always say goodbye to your hosts and always hand-write a thank you note. Recently we’ve converted many guests to become Brussels sprouts lovers who would previously never touch them. These are just great served with toothpicks for hor’s d’ouevres or as a vegetable side dish. Serves 4. 1. Pre-heat the oven to 400°F. Clip the ends of the Brussels sprouts and remove any tough outer leaves. Halve the smaller and quarter the larger sprouts and place in a roasting pan or on a baking sheet. Toss the sprouts with the olive oil. Roast for 30-minutes until tender and browning. Meanwhile combine the syrup and vinegar in a small dish. Sprinkle the sauce over the sprouts a little at a time, tossing them to just coat. Season with salt and pepper. Serve immediately. • Freshly ground black pepper and salt, to taste. 1. Melt the butter in a medium-size skillet or sauté pan over medium heat. 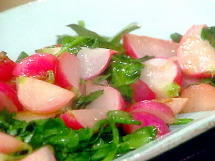 Add the radishes and toss to coat with the butter. Cover the pan and cook for 4 minutes, shaking occasionally. 2. Add the sugar and vinegar and toss over medium heat for 1 minute. Sprinkle with dill and season to taste with pepper. Serve immediately. The elusive flavor of parsnips melts with buttery pears in this ultra-smooth puree. Serves 8. 1. 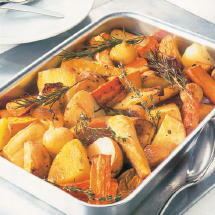 Place the parsnips in a medium-size saucepan and add water to cover. Heat to boiling. Reduce heat and simmer covered until tender, about 20 minutes. Drain. 2. Meanwhile, melt the butter in a small skillet over medium heat. Add the pears and sauté for 5 minutes. Add the Cognac and cook, stirring frequently, for 15 minutes. 3. Process the parsnips and pears in a food processor, fitted with a steel blade until smooth. Add the sour cream, allspice, and salt and pepper to taste and process just to blend. 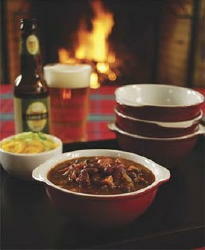 Serve immediately or warm gently over low heat just before serving. Roasting squash is wonderful at this time of year. We also like to roast a medley of root vegetables including parsnips, sweet potatoes, red potatoes, garlic cloves, onions, rutabaga, apples and turnips tossed with only enough olive oil to lightly coat them, sea salt and ground pepper. Each bite tastes heavenly. Serves 6. 1. Preheat the oven to 400°F. Peel and seed the squash and then cut it into ¾ to 1 inch cubes. Place the squash and the whole garlic cloves on a sheet pan in one layer. Toss with the olive oil, maple syrup, salt and pepper and bake for 30 minutes until the squash begins to brown, turning once during baking. 2. Sprinkle the pancetta and the sage leaves evenly over the squash and continue to bake for another 20-30 minutes until the squash and garlic are tender. Serve immediately. 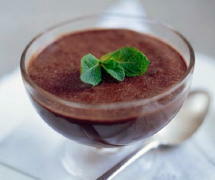 The holidays are a prefect time to serve this deepest, darkest, richest chocolate mousse we’ve ever met. Please serve with a dollop of whipped cream. Serves 8. 2. Add the egg yolks, one at a time, beating thoroughly after each addition. 3. Whip 1 cup of the cream until thickened, and then gradually beat in the sugar, beating until stiff. Beat the egg whites with salt until stiff. Gently fold the egg whites into the cream. 4. Stir about one third of the cream and egg mixture thoroughly into the chocolate mixture. Then scrape the remaining cream and egg mixture over the lightened chocolate base and fold together gently. Pour into 8 individual dessert cups, wine glasses or a serving bowl. Refrigerate for 2 hours, or until set. 5. Meanwhile, whip the remaining 2 cups of cream until thickened, add the vanilla, and whip to soft peaks. Top each serving, generously.